Penny Wade travels to Barcelona to perform in a concert with her orchestra. But the trip is not quite what she imagined. 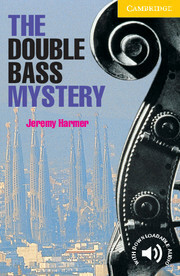 Her double bass goes missing and her boyfriend is acting very strangely. One night everyone is woken by screams and the orchestra manager is found dead on the street outside their hotel. Did he fall from the hotel window or was he pushed? And what has Penny's missing double bass got to do with it?